The US Consumer Product Safety Commission (CPSC) is advising people to avoid charging the toys, some of which are Bluetooth-enabled, overnight. Children of all ages are also warned not to put fidget spinners of any kind in their mouths. A recent BBC investigation discovered unsafe toys on sale in the UK. Although intended for stress relief and popular with both children and adults, fidget spinners have also reportedly been the cause of accidents. "Fidget spinner users or potential buyers should take some precautions," CPSC's acting chairwoman Ann Marie Buerkle said in a statement. "Keep them from small children. 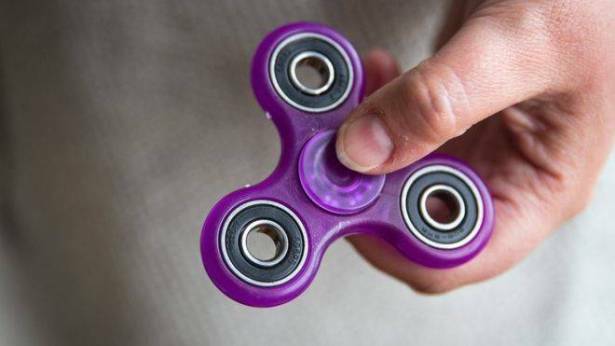 The plastic and metal spinners can break and release small pieces that can be a choking hazard, and older children should not put fidget spinners in their mouths." The commission wants all retailers to ensure that fidget spinners marketed at children aged 12 and under meet the US Toy Standard ASTM F963-16. In June, a Bluetooth-enabled fidget spinner that played music reportedly burst into flames after being left to charge for 45 minutes in a family home in Alabama. The gadget left a burn on the carpet but was discovered by the family before it caused more damage. And in May, another battery-operated fidget spinner caught fire after being charged for less than half an hour, according to Michigan local TV station NBC 25 News. The toy had been sold without its own charger, so the family had used one from another device. "Like any battery-operated product, consumers should be present and pay attention to their devices while charging them," said Ms Buerkle. "It is important to use the charging cable that either comes with the fidget spinner, or one that has the correct connections for the device, as charging cables are not interchangeable."